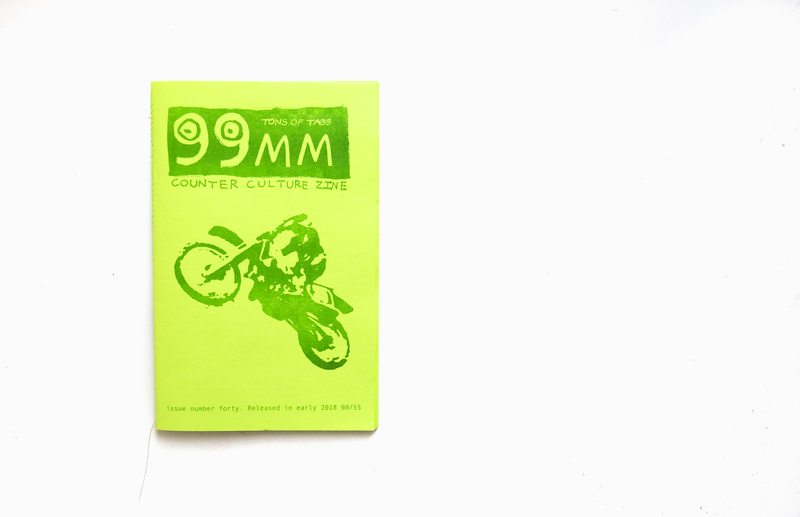 The last time I reviewed the 99mm zine I was surprised to find that the publication had been in production for twenty years! So it’s good to know that it’s still going strong as Ian Vanek has recently released, what he believes to be, the best 99mm yet! This time the zine’s contents aren’t published in the standard zine scheme of black & white but a cool jazzy green with a stitched spine. Apparently this is in commemoration of its 40th edition which harks back to the zine’s origins as a blue DIY magazine. In the intro to this issue Vanek delves a bit into the history of 99mm and his thoughts on his zine practice which “gets more and more obsolete with each passing year.” Presumably the point being that, for better or for worse, the internet has taken over print and analogue as the dominant source for graffiti media. The internet has created a sort of content overload which probably makes graffiti less exciting in some ways. Conversely, aside from all the great blogs and sites to be found, the internet has made traditional media more easily accessible to wider audiences. This site has reviewed all sorts of publications which would be a lot harder to get hold of if not for the internet. 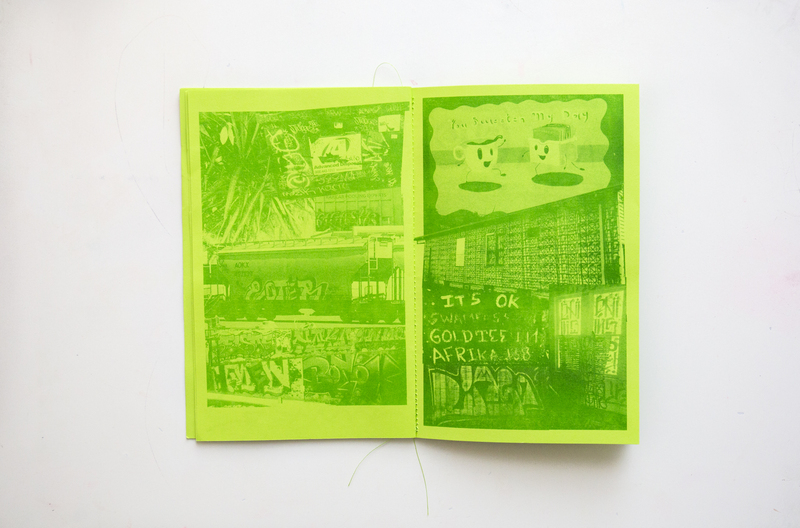 Vanek describes his zine making as a horror vacui collage that perfectly matches the production of graffiti. This is the concept of filling all empty space with images. So while 99mm has an oldskool punk, cut & paste, design this technique also reflects the content. Graff fills urban spaces that are often dominated by imposing architecture which deliberately incorporate large structures void of any decoration or texture – think concrete and bland plastered walls in monotone colours. 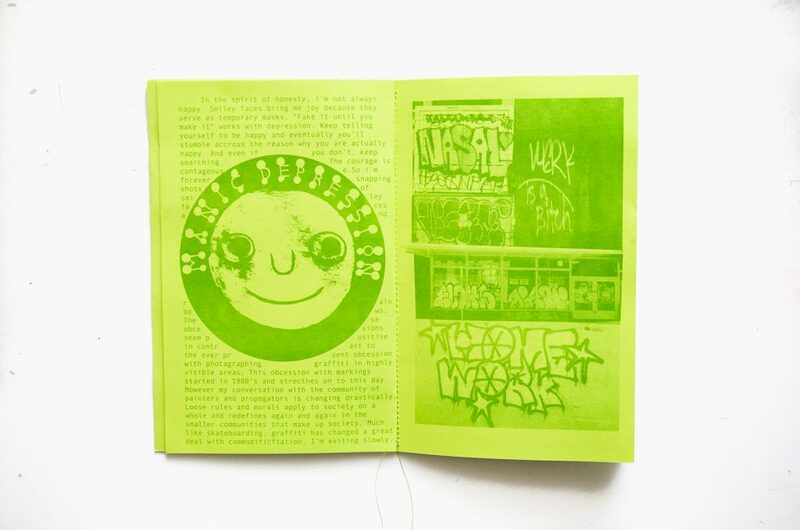 So like any urban space graffiti on vans, hoardings, a house camouflaged in repetitive lines, shutters and freights all jostle for the tight space that are the pages of the 99mm zine. It’s observed that these “images have a sight specific shelf life… harmonizing with the ‘low art’ form of photocopied fanzine making.” Quite a few adverts also seem to creep into the background of this issue. Obviously these don’t appear for commercial purposes but rather as a reflection of the urban landscape. They’re another element of Vanek’s personal interest in typography and how we interact with it on a daily basis.